Okay, the cuticles aren't cleaned up properly and they're bad photos but I can't help but LOVE these! 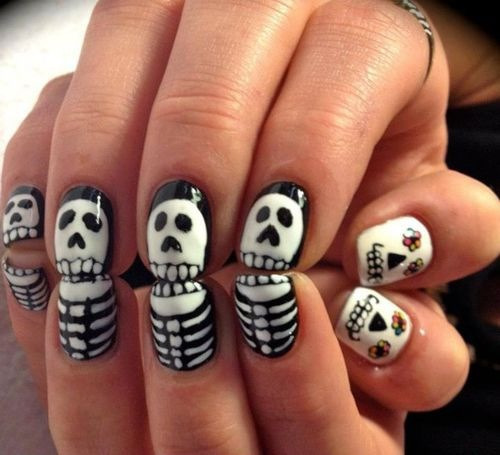 Skull nail art FTW! They're a direct copy of these nails, and I did them on a lovely friend of my brother's called Brittany. I'm going to have to do these on myself sometime, too. They're just too hilarious not to. I love how they join up to create half a skeleton... I haven't done much of that sort of thing, but it makes a manicure just that little bit cooler. I've been offered full time work! Not going to leave much time for nails and blogging but I WILL MAKE IT WORK! Best part is that I can afford health insurance now :). Also, my Maybelline stuff arrived and I'll be doing heaps of videos this weekend! Then I'll spend hours and hours in frustration as my computer freezes every 10 seconds while I'm editing... yay. These are adorable. They make me think of what the skeletons of the Canadians in South Park would look like, lol! I really liked these ones! They're really cool!